Bees have fascinating sensory and behavioural capacities: they can see ultraviolet and polarised light, can learn to navigate precisely over miles, they can learn numbers and sequences of landmarks, and some species even have a symbolic "language". 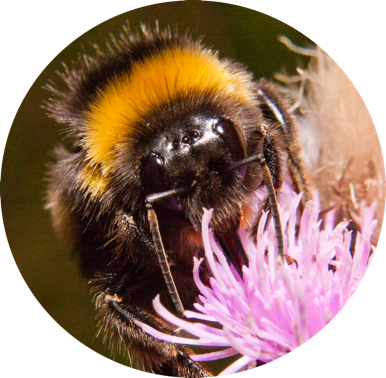 We study the mechanisms and evolution of the sensory systems and behaviour of a wide variety of bee species. We are especially interested in how vision, olfaction, communication and learning behaviour are tuned to the environment, and how they are used in the economy of nature. Many of our native pollinators are under threat from habitat loss and lack of suitable flowers. But we can help! How? By planting bee-friendly flowers! Do you have a garden, roof terrace, balcony or even a window-sill? If so, click on the bee to find out how you can help save London’s bees, help bee research, and win prizes! Chittka Lab also hosts the Floral Reflectance Database (FReD). Interested in post-doctoral work? Applications currently invited for Marie-Curie post-doctoral fellowships Please email your CV asap to Lars Chittka.